This concert was given in Poděbrady Theatre c.1973. 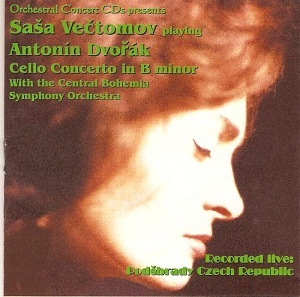 The scene is set in the booklet note which relates that the recording engineer Geoffrey Terry was invited to the Sunday afternoon concert by the cello soloist Saša Večtomov (1930-1989) and Ivan Moravec. He was hoisted onto a small platform above the stage and it was in this ad hoc position that he recorded the concert. It’s true also, as he intimates, that the sound in the concert was rather boxy. It doesn’t particularly open out, nor is there much bloom to it. However as a snapshot of a single performance it does serve one invaluable service to posterity - and that is to memorialise that marvellous cellist in his performance of the Dvořák Cello Concerto. One takes a while to adjust to the audio; the strings sound rather recessed and perspectives are not as natural as Terry managed to achieve in more sympathetic recording environments, even in rather ordinarily intractable acoustics such as London’s Royal Festival Hall. Still, one listens to Večtomov and his unidiosyncratic phrasal assurance and tonal qualities with great admiration. His legato is splendidly deployed, but never indulged; he never takes liberties or becomes too elastic in his approach. As the concerto develops it’s clear that Večtomov, so august a member of the Czech Trio, was certainly a big enough concerto soloist, but one who does not seek to impose his personality onto the music. Instead he illuminates it from within. Give and take with wind and brass principals is a given with a musician of this calibre. True, there is quite some vibrato in the horns but the winds are articulate and dovetail with acumen and technical polish. Večtomov’s commentaries in the finale are for once heard in a right light, and where necessary he accompanies or qualifies ruminatively. The reminiscences of the slow movement are all the more effective for being slightly understated; noble simplicity is the order of this day. There is directness but not militancy, pliancy and variety of tone colour, an avoidance of spurious pathos, and a close focus on the purely musical qualities of the work. This is not quite as commonplace as one might think. I’ve not mentioned the conductor for a reason. We don’t know who he is. Whoever he is he takes Suk’s Pohádka at a relatively sedate but affectionate tempo, one of the slowest ones in my experience. As a result it’s not quite as detailed as it might be and rhythms don’t kick with the expected animation. But there’s an appealing first violin solo - not spotlit, thankfully, as are so many anaemic studio recordings of this piece - and a well marshalled animating pizzicato. Swans and Peacocks - the second movement Polka - is nicely accomplished, though some will find Mourning Music (the third section) rather brisk and businesslike. Here’s where Macal’s 1968 Czech Philharmonic traversal really proves its worth. The concert began with a pleasing performance of Dvořák’s In Nature’s Realm, though one that lacks the weight, sheen and sculpting of Kertesz’s slightly earlier late 1960s recording with the LSO. Where does this leave one? This all-Czech concert preserves Večtomov’s reading of the concerto, one he never committed to posterity in the studio. That’s a blessing. The rest of the concert is rather less successful. But just who was that mystery man on the box?